Valencia MotoGP test times - Wednesday.Nov-16-16. Maverick Vinales finished on top of the times heets during both days of his Yamaha debut during official testing at Valencia. Valencia MotoGP test times - Tuesday.Nov-15-16. Following Sunday's Valentino MotoGP season finale, riders returned to the circuit on Tuesday for the start of an official winter test. The two-day outing marks the first chance for riders to appear with their 2017 teams. Tuesday's debuts included triple MotoGP champion Jorge Lorenzo at Ducati, Andrea Iannone at Suzuki, Bradley Smith and Pol Espargaro at KTM, Aleix Espargaro at Aprilia, plus Alvaro Bautista and Karel Abraham at Aspar. The four rookies stepping up to MotoGP from Moto2 were also on track: Johann Zarco and Jonas Folger at Tech 3 Yamaha, Alex Rins at Suzuki and Sam Lowes at Aprilia. Only Lowes has previously tested for his team. Former Aspar racer Eugene Laverty made his debut on an Aprilia RS-GP, which he will help develop alongside his 2017 World Superbike commitments. Francesco Bagnaia got to ride an Aspar Ducati as a reward for taking two victories for the team's Moto3 project. Danilo Petrucci has returned to Italy for family reasons and is being replaced at Pramac by Ducati test rider Michele Pirro. Vinales took over from new team-mate Rossi at the top of the timesheets in the middle of the afternoon. Vinales used the 2016 Yamaha today, while Rossi also tried the 2017 bike. Rossi, Pol Espargaro, Cal Crutchlow, Iannone, Tsuda, Lowes and Laverty all walked away from falls. 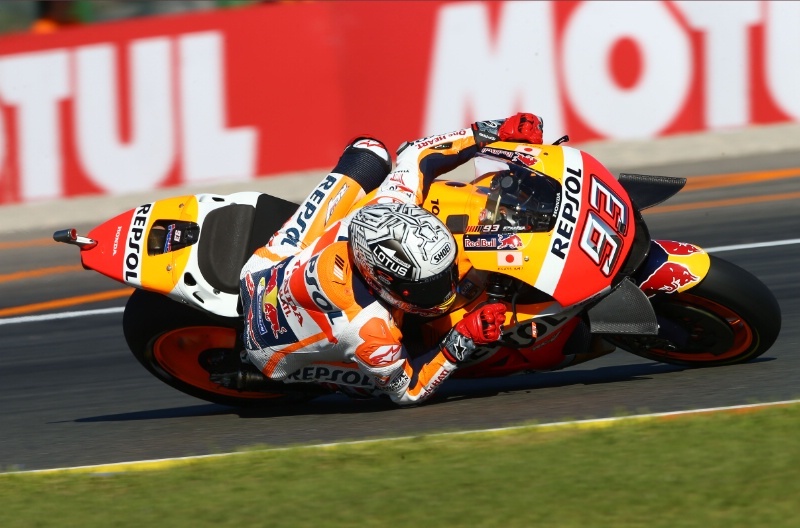 Reigning champion Marc Marquez was on track with both the 2016 and 2017 versions of the Honda RC213V. The Spaniard led the early stages, before the Yamahas hit the front. As rumoured, the new Honda sounds like it has a 'big bang'-style engine. Lorenzo made a late push up the timesheets for a close third on the Ducati, having spent all day on the 2016 machine. Team-mate Andrea Dovizioso did however spend time on the GP17. 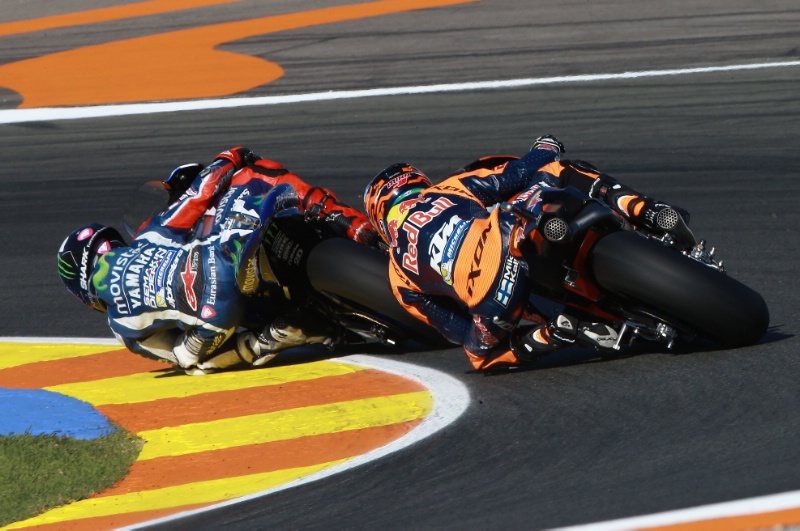 MotoGP Valencia - Race Results.Nov-13-16. 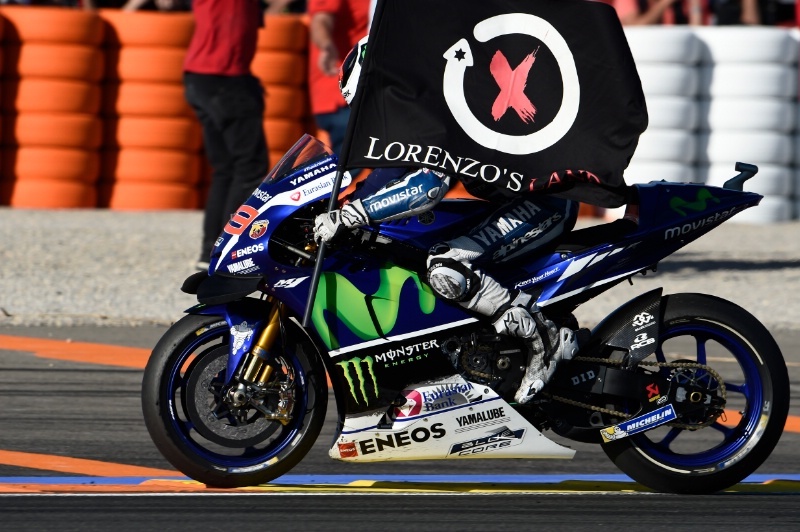 Jorge Lorenzo dominates the Valencia MotoGP season finale, his final race for Yamaha. Marc Marquez broke clear of a thrilling battle for second to put late pressure on Lorenzo, with Andrea Iannone getting the better of Valentino Rossi for third in his last race for Ducati. Rossi and Iannone fought throughout the race. Today's result also means that Honda wrapped up the 2016 manufacturers' title and Movistar Yamaha the teams' world championship. Dani Pedrosa was returning from injury, walking away unharmed after a crash. KTM was making its factory MotoGP debut as a wild-card entry for test rider Mika Kallio, ahead of next season's full-time entry. MotoGP Valencia - Warm-up Results.Nov-13-16. 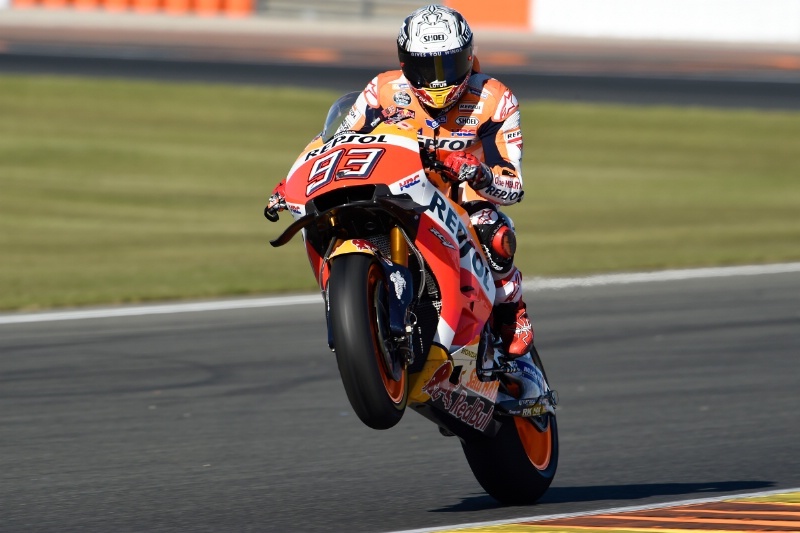 Marc Marquez sets the pace during the final warm-up session of the season, at Valencia. MotoGP Valencia - Full Qualifying Results.Nov-12-16. 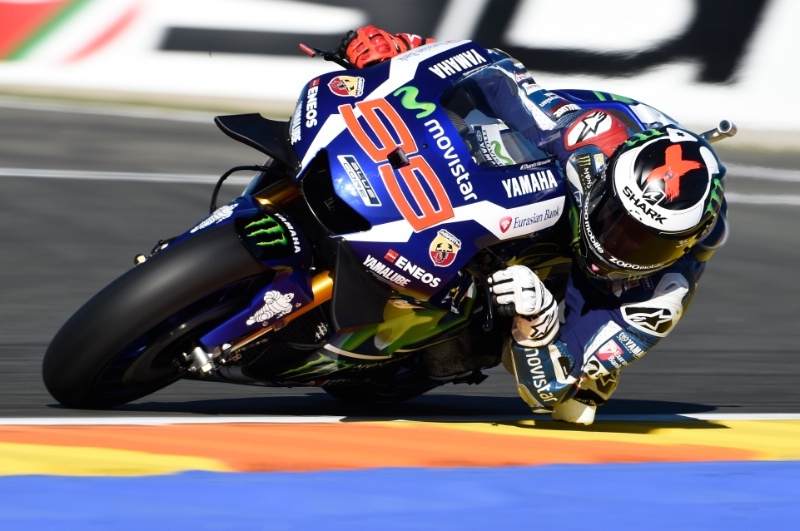 Jorge Lorenzo sets pole position for the Valencia MotoGP season finale with a new lap record on his Yamaha farewell. Marc Marquez and Valentino Rossi complete the front row, Marquez having earlier been furious with Andrea Iannone. Cal Crutchlow fell during the session. MotoGP Valencia - Free Practice (4) Results.NOV-12-16. 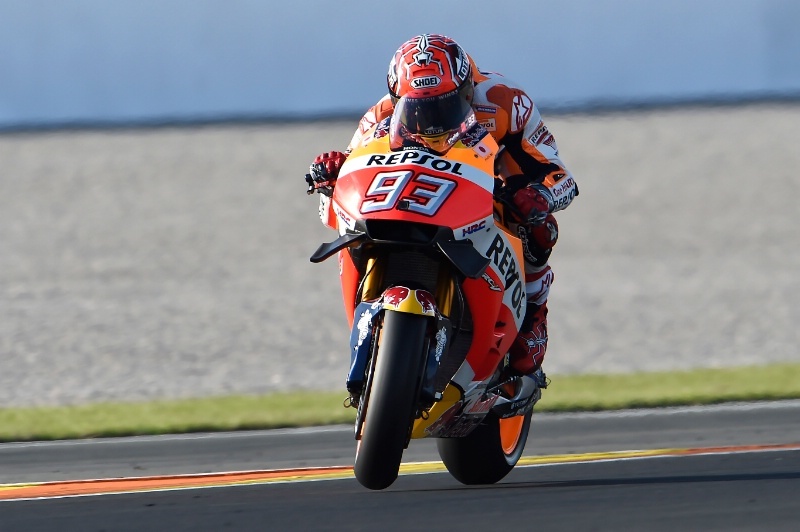 Marc Marquez fastest during final practice at the Valencia MotoGP, despite falling at the end of the session. Repsol Honda team-mate Dani Pedrosa, Danilo Petrucci and Yonny Hernandez also walked away from accidents. MotoGP Valencia - Free Practice (3) Results.Nov-12-16. All change on the timesheets with Marc Marquez taking over at the top during FP3 at the Valencia MotoGP, with Friday leader Jorge Lorenzo dropping to fifth. Dani Pedrosa is returning from injury. KTM is making its factory MotoGP debut as a wild-card this weekend, with test rider Mika Kallio, ahead of next season's full-time entry. MotoGP Valencia - Free Practice (2) Results.NOV-11-16. 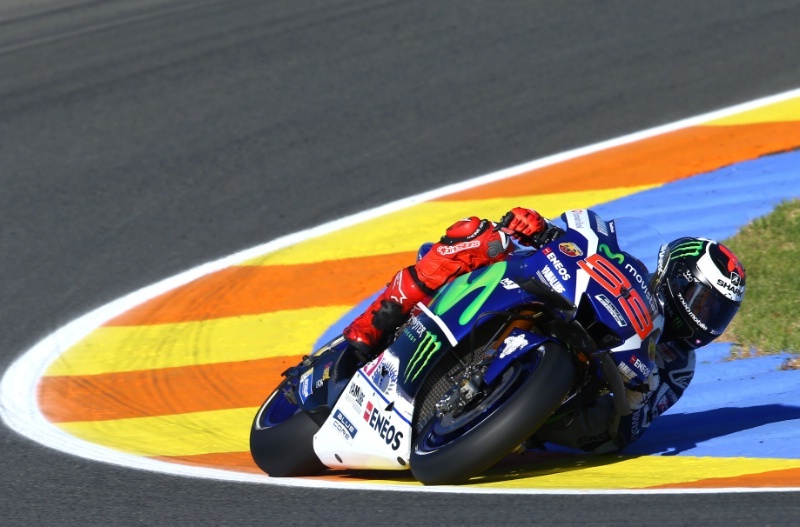 Jorge Lorenzo tops both Friday practice sessions on his Yamaha farewell at the Valencia MotoGP. MotoGP Valencia - Free Practice (1) Results.Nov-11-16. Jorge Lorenzo fastest at the start of his Yamaha farewell at the Valencia MotoGP. Team-mate Valentino Rossi overcame an early technical problem to claim second, ahead of reigning world champion Marc Marquez.